How could synapse number and position on a dendrite affect neuronal behavior with respect to the decoding of firing rate and temporal pattern? We developed a model of a neuron with a passive dendrite and found that dendritic length and the particular synapse positions directly determine the behavior of the neuron in response to patterns of received inputs. We revealed two distinct types of behavior by simply modifying the position and the number of synapses on the dendrite. In one setting – spatio-temporally sensitive - the neuron responds to a precise spatio-temporal pattern of spikes, but shows little change following an increase in the average frequency of the same input pattern. In the other setting – frequency sensitive - the neuron is insensitive to the precise arrival time of each spike but responds to changes in the average firing rate. This would allow neurons to detect different spatio-temporal patterns. 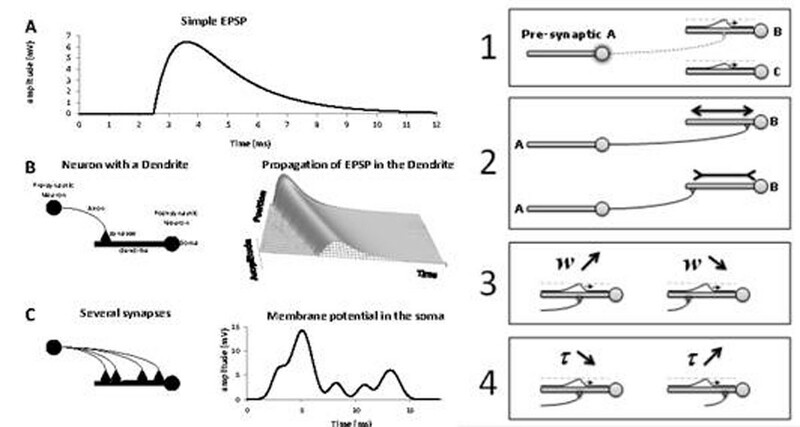 We present four local rules to train a network of spiking dendritic neurons. After training, every neuron of the network becomes specialized for a particular feature of the input signal. With these rules, the network acts as a features extractor where each neuron contains a TAND vector, similar to logical AND but including information about time between the two events in the input signal. Figure 1.